Welcome to the new Spokesman.com. Many months in the making, this design puts in the hands of our users an enhanced and simplified website that looks great on any digital device. We’ve taken advantage of the latest technology to improve storytelling through visuals and typography. We’ve unified the print and visual identity to reinforce the brand that has long been the preferred source of news and information in the Inland Northwest. In addition to a design that displays beautifully on whatever device you’re using, this redesign brings together the best pieces of two other major newsroom initiatives from last Fall: Publishing news as it happens, a.k.a. "digital first," and producing the news with a new publishing system that allows writers, editors and photographers to gather and produce content more collaboratively. As Editor-in-Chief Gary Graham writes, "The redesign and a recent upgrade of our editing software will help display our new emphasis on posting content more quickly and consistently." The advantage to you, the reader, is we can get more news to you as it is happening. Our new design is fresh and unique, presenting our best content in a format that we feel enhances the total reader experience. For a limited time, our paymeter has been turned off so that our readers can browse the new site free of charge. We invite you to explore the site and offer your feedback. 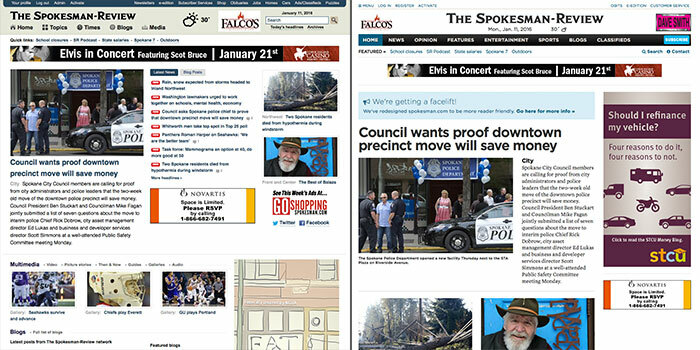 The Spokesman-Review provides the most complete news coverage in the Inland Northwest, but technology continues to change the way everyone uses the web. We needed to adapt with it to provide users faster and more convenient access to the news and information we offer. Among our goals was to unify our brand across our products -- both print and digital. We took advantage of technology that has advanced to the point that we can use the same fonts and typography that we use in our print design, something that wasn't at all possible when we last redesigned in 2008. Mobile devices are now first-class citizens, often some readers’ only access to the Internet. Instead of having a mobile website as more of an afterthought, we rebuilt spokesman.com from the ground up, focusing on providing the same experience to all readers, regardless of device. Some things are different, by necessity, given the space limitations of mobile, but we've gone to great lengths to keep things as unified as possible. This clean, simple design integrates our award-winning photography with our compelling storytelling more integrate and engaging fashion. You’ll see bigger, better display of photos along with other important pieces of media (audio, video, documents) that illustrate the heart of our stories. Some sections of the site will be updated in the coming months, including our sports team pages (Zags report, personalized news pages, Cougar football etc.) and others that had a minor visual update about four years ago. Those sections will be re-redesigned to match the newest look of the site. Also, expect big things from Spokane7.com. We'd love to hear what you have to say. Email us at webteam@spokesman.com. Leave a comment. Off-topic comments will be removed. Read on for answers to some questions you may have about what we’ve done. With improved navigation, we hope that we have actually made things easier to find. The lion’s share of our content continues to be part of our digital offering. Many sections have already been migrated to our new design (today’s news, blogs, photo galleries). All will share the same look and feel. The site supports all modern browsers. Hint: If you have Internet Explorer 8 or lower, you'll need to upgrade. We still have some legacy Flash objects we're trying to replace, so if you're on mobile or a tablet you might not see some older content, but all of our newer stuff is supported. The black navigation bar at the top of every desktop and tablet-sized page replaces the topics-times-blogs-media dropdowns. The nav bar places logical links to sections of content much like our printed paper. Clicking on one of those links (news, sports, opinion etc.) expands to a list of more links contained within that section. Where are some of the sections that I used to visit on the previous website? Many of the most important links you used in the past to navigate on our site are still at the top of the screen (quick links, obituaries, classifieds, e-edition), or found by using the nav bar. We’ve added a site index if you still can’t find what you’re looking for. How do I find the blogs? Blogs are found in the navigation bar at the top of every page. Click on the link and it will expand to display our list of active blogs. In addition, we have included a link to them in the list that's displayed when you click on the "menu" link on tablet and mobile. You'll also find we've included blogposts with related sections wherever it made sense to do so. Where are puzzles, jumble and horoscope? You’ll find links to them in the bottom of every page on the site. Obituaries remain a prominent link at the top of every page on the site. A lock icon next to a story like this one means that the story is behind our paywall. For more information about our paywall, click here. Most of content on the site remains at the same links as before, so if you’ve bookmarked anything, it should load, albeit with a new look. If you encounter an error, please submit feedback and we’ll work to fix it as quickly as we are able. If you’re trying to search for a specific story or blogpost, click the “search” link right below the main navigation bar to expand a search box. Type your search there. We will be adding a dedicated photo/video search function soon. How do I share stories, blog posts and photo galleries on my social media pages? On every story, blogpost and photo gallery, you’ll find prominent share buttons to post our content to Facebook, Twitter and Reddit (and Pinterest for photos). Where do I find customer service information? This page -- contains information about subscribing, managing your existing subscription, directory of departments, phone numbers and more. How do I submit a question or problem related to this redesign? You can use the comment form to the left to send us error pages, questions about where a feature you are accustomed to reading is now located etc.